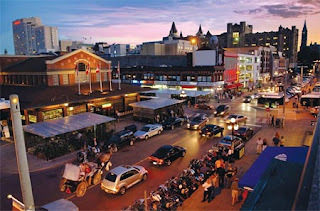 One of Ottawa’s biggest tourist attractions is also one of it’s oldest: the Byward Market. A mecca for tourists and locals alike, it’s a place that evolved to symbolize the best features of the city itself: a proud and harmonious blend of cultures and commerce. Over it’s 184 year history, the Byward Market has relied heavily upon word of mouth, but in today’s ever evolving marketplace, it seems “The Market” is changing with the times. Yes, The Byward Market has gotten into web marketing. Behold the bright, shiny, SEO driven Byward Market website. (No seriously, check it out!) It advertises all the best features of this historic gem including, upcoming events, a directory listing everything from restaurants to nightlife, to health and beauty services, and more. They also provide handy maps and an interactive calendar of sorts where you can click on any particular day to see what’s happening. Pretty cool.